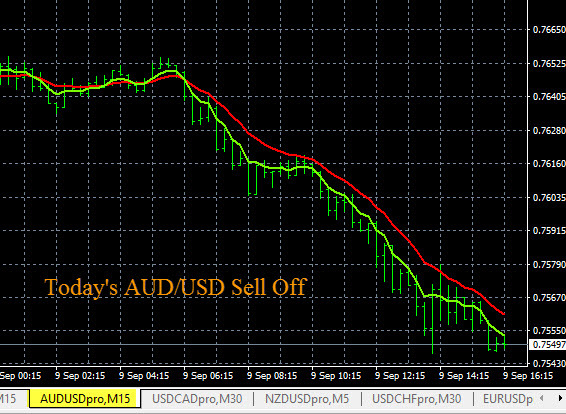 Today in forex trading the AUD/USD had a strong selloff. The sell signal from The Forex Heatmap® is shown below. This pair is approaching support at the 0.7515 area, we would scale out lots or exit any short term sells on this pair as the AUD/USD continues down to this price. When the AUD/USD has strong selloff it is always because one currency is weak and the other currency is strong. 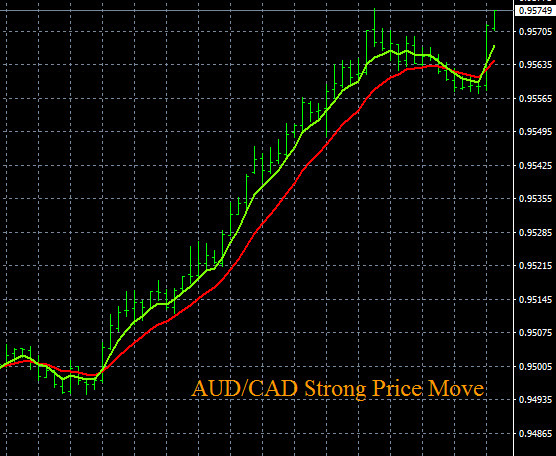 Today the AUD was weak and the USD was strong. The same thing in reverse can happen when there is a strong up cycle. 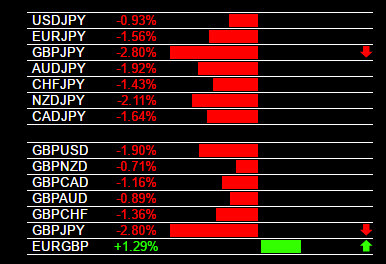 This is why The Forex Heatmap® is so valuable. It works for short term buy or sell trades like today, but it also works when entering strong up trends. In the case of trading with the trend, traders can hold onto their position and ride the trend with the strong entries this tools helps to provide. It is part of our overall trend based trading system. Since the AUD/USD is not trending right now, just cycling between support and resistance, we recommend good money management and scaling out lots. Any forex trader can trade profitably using these principles and tools, parallel and inverse analysis and currency strength are vital to the success of your forex trading program. 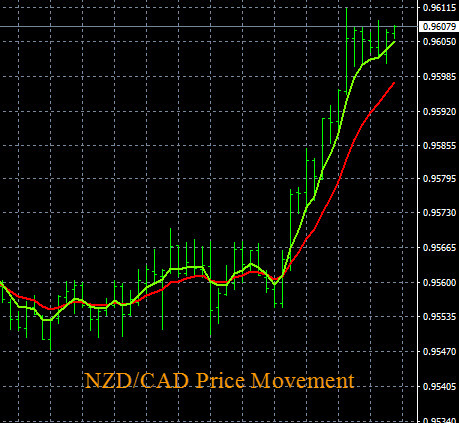 Today in forex trading the NZD/CAD has a strong move to the upside. 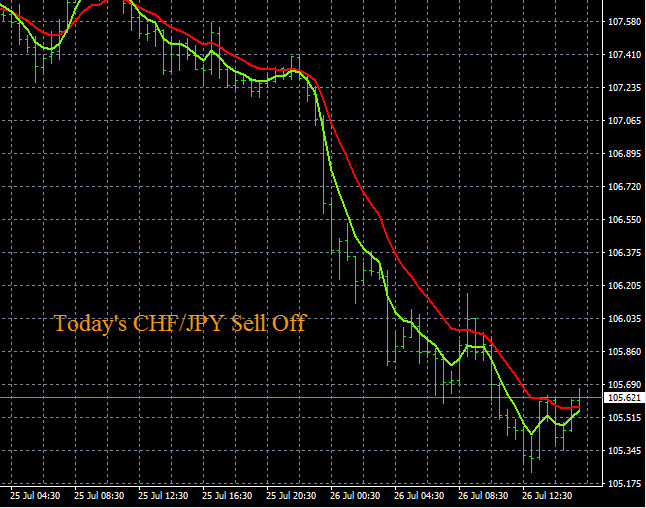 The live buy signal from The Forex Heatmap® is shown below in the images. 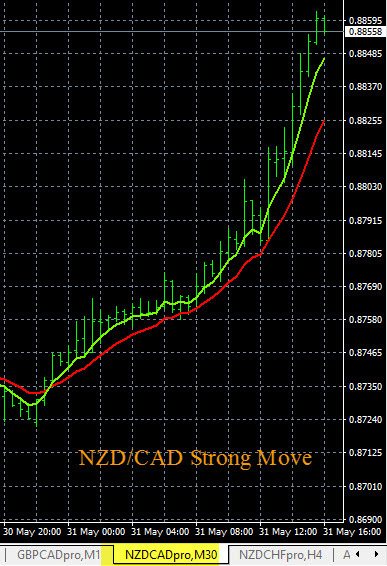 The NZD (New Zealand Dollar) was strong on all pairs today, driving a lot of movement in the pairs in this currency group. This pair is ranging on the H4/D1 time frame, and it should continue up to the 0.8900 resistance area. Today’s movements were strong but these pairs are not in strong trends, so we are setting the 0.8900 resistance price target. 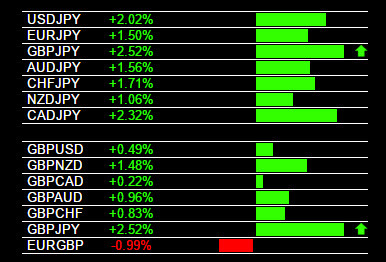 The signals you see below from the heatmap work for 28 pairs, including 7 major pairs, and also trading signals for 21 exotic pairs like the NZD/CAD. 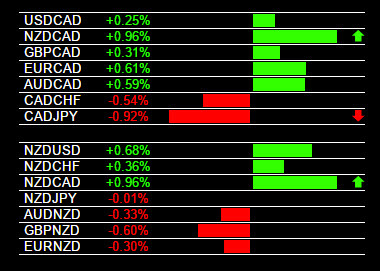 Today in currency trading the Canadian Dollar (CAD) was weak across all pairs. See the live trading signals and alerts below in the images from The Forex Heatmap®. 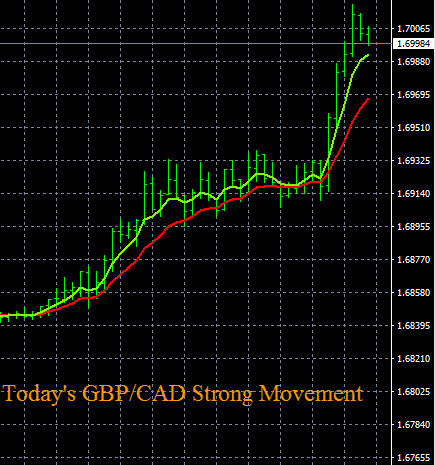 The USD/CAD moved higher but we consider this to be a shorter term trade since the overall trend is down on this pair. 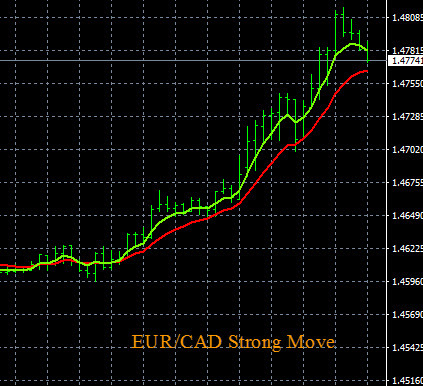 The EUR/CAD also moved higher. This EUR/CAD is trending up on the D1 time frame and should continue up to the next major resistance area at 1.4950, see the chart movement for this pair below in the images. The Forex Heatmap® provides live trading alerts for 28 currency pairs in eight currency groups, including the CAD pairs. 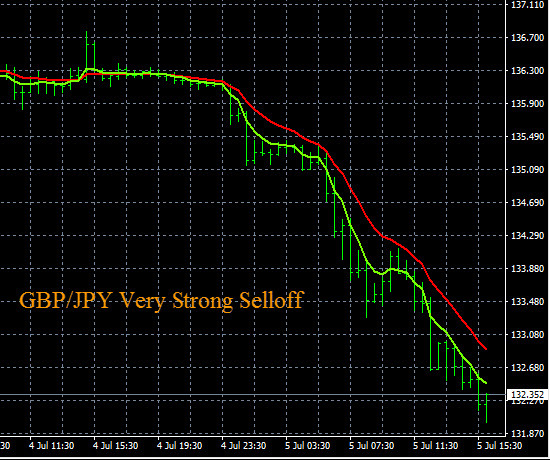 Today in forex trading the GBP/JPY had a buy alert on The Forex Heatmap®. This pair had very strong movement to the upside. This pair is likely to continue to the next major resistance area at 162.00. Since the overall trend on the MN time frame is still down, we suggest scaling out lots on any profitable buy entries and trading on this pair. Other JPY pairs like the CAD/JPY also broke out and moved much higher today, the CAD/JPY is forming a larger trend on the W1 time frame. The live trading alerts form The Forex Heatmap® are for buying and selling 28 pairs. 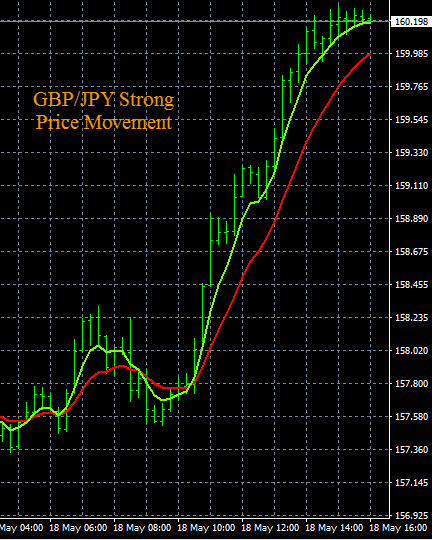 Below you can see the heatmap live signal showing GBP (British Pound) strength and JPY (Japanese Yen) weakness in the market, creating the strong movement in the GBP/JPY. 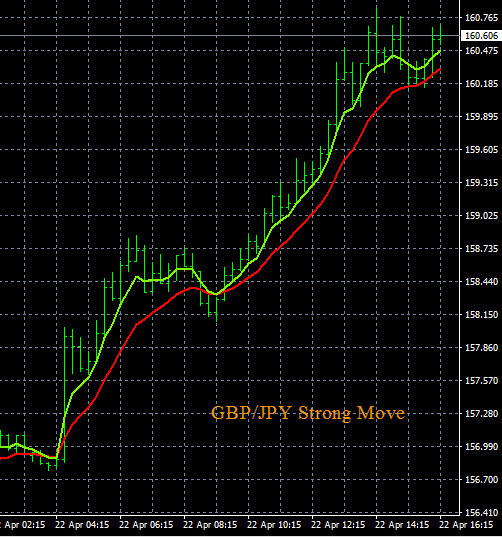 This is a powerful forex indicator that is part of our profitable trading system.